Does integrity matter? If you could have a confidential and totally honest and transparent conversation with a politician in Washington D.C., or a used car salesmen in your town, or a lawyer in the city, or an employee at Google or Amazon, or a division head at the Department of Justice, or a supervisor at the USGS, or a journalist at the Washington Post, and you asked them, “Does integrity matter,” what would they say? What is integrity? I’m a real estate broker who has 20 years of real estate law practice under my belt, and I can tell you that the legal profession is much worse than most people think, and most people already have plenty of lawyer jokes. “How can you tell when a lawyer is lying? His lips are moving?” We’ve all heard them for decades. And we’ve heard plenty of sarcasm about used car salesmen and Catholic priests. The phrase “fake news” has become one of the most recognized and used phrases of our day. Why? Because fake news is everywhere. It’s hard to know what’s true and what’s not true in the news, whether it’s news on T.V. or the print newspapers or on Facebook. And we see well documented news that is not fake being deleted and demonetized on Youtube because Youtube, like the major news organizations, no longer believes in freedom of the press or the right to express one’s opinion. What happened to the truth? Does no one care about the truth any more? Does integrity matter or not? I guess it depends on who you’re asking. We are living in “interesting times” for sure, but they are difficult, because many people at all levels today from big government to small companies seem to have no qualms about looking you right in the eyes and lying to you so they can get in your wallet (or get your vote). Of course, all this means that you and I as consumers must pay attention to that latin phrase, “caveat emptor,” or “buyer beware.” There’s no one looking out for your interests except you, right? Unless, of course, you find someone who is honest, competent, professional, and has integrity, and let’s face it, that’s not easy to do when everyone says the same things and you can’t tell who is lying and who is telling the truth. In this day even the question “Does integrity matter?” is likely to be laughed at. 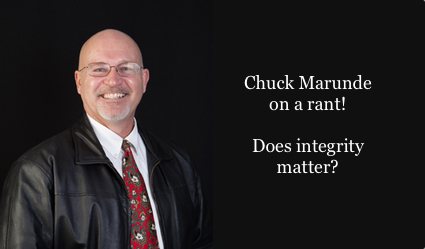 What spurred me on to write an article focused on the question, does integrity matter? It was a phone call last night from a woman who is dealing with a nightmare scenario with her listing agent. I won’t go into detail here, and of course, I won’t mention names or companies. My focus here is the lack of not only integrity these days, but the lack of competence, professionalism, knowledge, loyalty, discernment, and wisdom. Unfortunately, I get too many calls from good people who hired the wrong real estate agent. Does Integrity Matter: What Happens When It is Gone? When integrity no longer matters, all of these other important character traits you expect from any professional you hire just go out the window, too. If one has no integrity, then what does it matter if one doesn’t pursue knowledge for the sake of doing a good job for clients? Without integrity, who would care about competence or professionalism? Forget the best interests of the clients. All that matters is being able to manipulate clients so one can make as much money as possible. Without integrity, loyalty to the client doesn’t matter, and why should I care about discernment or wisdom? Oh wait, I’d better pretend to have all these traits, or the client won’t list with me or buy a home through me. I’d better fake my way to integrity so I can take care of number one, because I don’t really care about my clients. Does integrity matter? You’re damn right it does. Forgive me for going on a rant today, but these things needed to be said. My final point is simple. If you want to list your home with a real estate agent who truly has integrity, or hire a buyer’s agent who has integrity, and you want an agent who possesses these character traits, you’d better do your research and due diligence to find that agent and filter out all the rest. That’s your job! It won’t be easy when everyone who tells the truth sounds just like everyone who lies. It won’t be easy when everyone smiles nicely, talks with the same pleasant voice, and when everyone smells nice. But that’s your most important job–to discern who has integrity and who possesses these precious traits you expect and demand from your real estate agent. Does integrity matter? If it does to you, then prove it by hiring only agents who have integrity. You are the “Truth Detector” when it comes to hiring the right real estate agent. If you hire one who has no integrity or is not competent, or not professional, or not loyal to you, you will have no one to blame but yourself. I know that sounds harsh, but who’s job is it to here the right person? That would be you my friend. The ball is in your court.